Our proficiency lies in presenting Antique Clocks. Professionals manufacture this product keeping in mind prevailing market demands and industry laid norms. It is best for home, office etc. This is a very beautiful decorative piece. Add this conversation piece to your home decor today. 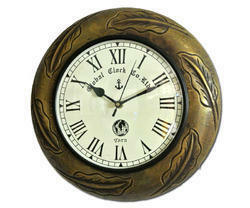 Clock Dia:-4", Clock Ht:- 8"
Antique Clocks with different designs and Handcrafted Frames. These clocks are painstakingly made with designs made with inlay of coloured coconut shell. High in quality & look to our clients.